Some Quick Base users have tables with hundreds of fields. In these cases, filtering the Fields list to show a subset of those is often useful. The Fields list is accessed by choosing a table from the Table bar, clicking SETTINGS in the Page bar, then clicking Fields. The Search fields box appears at the top of the Fields list. Type a search term to limit the fields shown to ones whose Field Labels contain that term. All Fields – Show all fields. Use this to remove any filtering currently in place. Text – Show fields with Text types (including Text, Text - Multi-line, Text - Multiple Choice, and Multi-select Text). Numeric – Show fields with Numeric types (including Numeric, Currency, Percent, and Rating). Date – Show fields with Date types (including Date, Date/Time, Time of Day, and Work Date). Duration – Show fields with type Duration. Checkbox – Show fields with type Checkbox. Phone Number – Show fields with type Phone Number. Address – Show fields with type Address. Email Address – Show fields with type Email Address. User – Show fields with type User. List - User – Show fields with type List - User. Multi-select Text – Show fields with type Multi-select Text. File Attachment – Show fields with type File Attachment. URL – Show fields with type URL. Report Link – Show fields with type Report Link. iCalendar – Show fields with type iCalendar. vCard – Show fields with type vCard. Record ID# – Show fields with type Record ID#. Relationship – Show fields that are part of relationships (Summary, Report Link, Formula - URL, reference, lookup, and proxy fields). Formula – Show fields that are formulas. Default in reports – Show fields that will be automatically added to Quick Base reports. Reportable – Show fields that will be used in lists of filtering criteria in Quick Base. Searchable – Show fields that will be searched for in Quick Find and <Some field> searches in Quick Base. Note that the field types in the Show dropdown will be grayed out and unselectable if no fields with those types appear in the current table. Hover your mouse cursor over the active field types to show how many fields of that type appear in the current table. To sort the Fields list by a column, click the column header. By default, the Field Label and Type columns are shown. 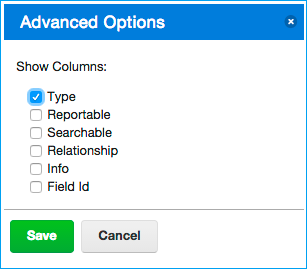 Click the Advanced Options link to show other columns that can be added to the Fields list. Select the columns to show and click Save. Note: The order of columns in the default report is now set on the default report settings page, and is no longer affected by the order of fields in the Fields list.